The last time I wore a floral print was in 4th grade. It was a jean jacket and denim skirt combo featuring big white dreamy flowers on a pink background. I loved that outfit … until I got motion sickness on a plane while wearing it. (You can use your imagination as to how that flight ended.) 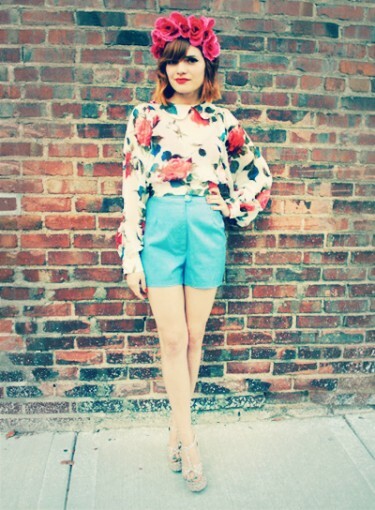 Needless to say, I haven’t worn floral print since … well, until now. Click here for more on the floral fashion trend. After seeing tons of amazing floral print clothes and outfits, my resistance to this trend proved futile. (I like flowers, I admit it! I’ll just have to repress my bad plane ride memory.) My first purchase? A floral print dress. But now there’s a new problem. Summer is over. Can you still wear florals in those cooler months? Of course you can. It just takes a few ready-for-fall tweaks, like adding tights or a cardigan. And if you’re looking for a floral print that’s perfect for the crisp air, go for one with a black background. Dark colors instantly fall-ify any print. And lastly, if you’re not ready to don a head-to-toe floral outfit, there are plenty of other ways to incorporate this trend into your look. Click below to see all the different ways you can wear floral print in fall.